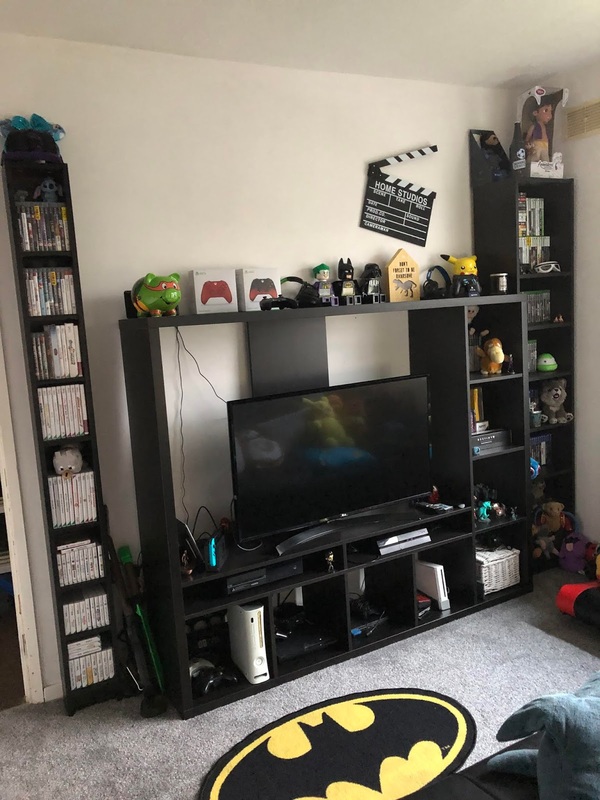 When we were originally house hunting we always said we wanted a games room so when we found the house we are in now we knew it would be perfect. With 3 decent sized bedrooms we were spoilt for choice that is why we opted for the biggest bedroom as our games room as we knew we had plenty to fill it. Plus we knew this was the room we was going to be spending the most time in. As you come into the room the wall on the right is filled with a few posters a game zone sign and our ever growing collection of pin badges. 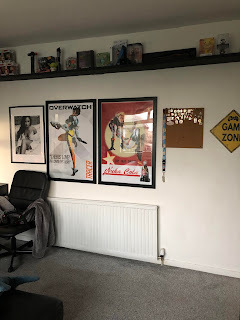 The posters just add something to the other wise blank space plus they add a bit more of the gaming character to the room, we have my favourite from Overwatch Tracer and a Nuka Cola one for Liam. Then we have my Demi Lovato one that I got when I went to see her last year. The long shelf above here has plenty of my collectibles on it which range from Pokémon to Harry Potter with a bit of Star Wars and Minecraft thrown in. Then we have my little corner. This is where most of my blogging happens mixed in with some PC gaming. I have my little shelf with Tracer and Stitch on it and my big whiteboard up on the wall. The whiteboard is where I put rough blog schedule & any important things coming up, it has actually helped me out quite a bit. 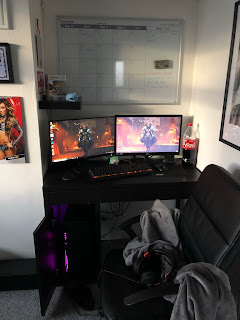 I have recently added some LED lights to the back of the desk to go along with my new gaming PC and keyboard although the keyboard will be switched out soon. The dual monitors are also great for blogging as I can write my content whilst watching something on the other screen or looking at product info. On the other side to my desk is Liam's set up where he spends the majority of his time, he also has his own whiteboard and the shelves above our computers are filled with our Funko Pop's & Tsum Tsum's I just wish Liam would keep his Funko's in the box. In front of our desks we have a sofa bed, we wanted something comfortable to sit on whilst playing on our consoles and this really does the trick. Plus it is somewhere else for people to stay if needed. It is also filled with some geeky soft toys and pillows and a giant Ikea shark. Now onto my favourite part our TV and consoles, plenty of hours get spent here playing FIFA and ignoring other games. Both book cases either side are filled with plenty of games for us to get through. On top we have a few random bits and our controllers. Each section on the bottom of the console unit holds a console whilst the PS4 & Xbox One are on the longer slimmer shelves. The Switch is currently right next to the TV. The little cubes down the right have a mixture of Disney Infinity characters, PS2 games, accessories and other random bits in, I am sure these will change around over time but for now I love it. We also need another poster for up above the unit. We still have bits to add like a little side table we just bought but I am really happy with how it looks and how it has all come together. 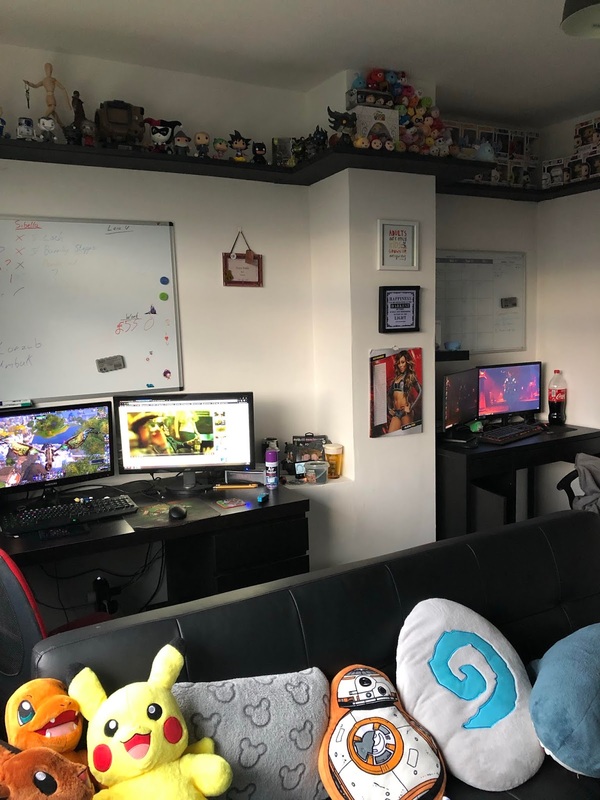 It is the perfect room for us to spend 90% of our time, I can't wait for the nephew to be old enough to enjoy games too because there can be hours of fun spent in here teaching him how to play the games we love. So there you go that is what our games room is looking like.